In 2003, when a mysterious ancient chamber was discovered beneath the Romanian Sphinx in the Bucegi Mountains, it became a state secret of the highest level for Romania and its new partner, the United States, whose advanced technology enabled the discovery to take place. The primary custodial agency of this remarkable chamber full of holographic technology is Department Zero, a secret service unit that answers only to the Romanian president. Ever since, there has been a continuous and persistent effort by certain Romanian and American factions to undermine the authority of Department Zero in order to gain access to and control this technology. 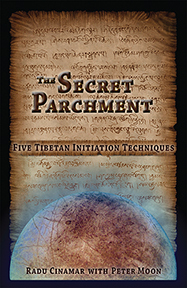 The Secret Parchment — Five Tibetan Initiation Techniques tells the story of the detailed political intrigues behind these discoveries and also how these have been subject to intervention by superior spiritual forces, one of which concerns the arranged discovery of an ancient Tibetan manuscript which is revealed and explained in this book. After an ancient manuscript was translated, a mysterious antenna-like structure was discovered as a result of melting ice near a secret American base in Antarctica. Acting as some sort of cosmic buoy, it has an energy signature connecting both to Jupiter’s moon, Europa, and an area of Transylvania where the remains of an ancient civilization was discovered in 1990 amidst vast tunnels of solid gold. Long ago classified as the top state secret of Romania, this location became the center of intrigue inside and around Department Zero. Although not actually penetrating the underground area itself, Peter Moon spends some time with his Romanian contacts in the general area and determines that this ancient civilization is still very much alive and active. Contents include: Remote Viewing; Important Mission; The Secret Parchment; “Hot Spot” in Antarctica; The Sureanu Massif; more.